Black pepper is a flowering vine cultivated for its fruit,which is generally dried and utilized as a spice and seasoning. Black pepper is widely cultivated in south India. Black pepper has been constantly used since olden times for both its flavor and as a traditional medicine. It is omnipresent in the cutting edge world as a spice and seasoning, and is often paired with salt. 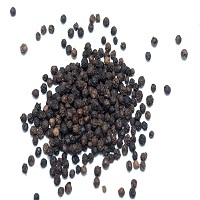 Determination of the amount of benzyl glucosinolatein black pepper seed and products meets the expense of a sensitive method of determining the degree of adulteration with papaya seed. Papaya seed mixed with black pepper not only lowers the quality but also causes some stomach disorders.